The Center for Applied Internet Data Analysis (CAIDA) is located at the San Diego Supercomputer Center (SDSC) on the campus of the University of California, San Diego. The nearest intersection is Hopkins Drive and Voigt Lane. Requests for permission to use CAIDA images in papers, journals, publications, or for other purposes can be made by filling out an image request form. CAIDA is one of the several research groups based at the San Diego Supercomputer Center (SDSC) on the UC San Diego campus. For general directions to the SDSC, see the SDSC Visitor Information page, which also includes hotel information and information about scheduling tours of SDSC. For visitations with the researchers at CAIDA, it is recommended that you contact info@caida.org to schedule your visit in advance unless you are already expected for a conference, workshop, meeting. On arrival to SDSC, visitors can take the elevator to the third floor where most of CAIDA is based. The CAIDA administration office is on the 3rd floor in Room 332 and can be called directly at (858) 534-5109. The general core of CAIDA's researchers are in Room 308. Shuttle: Shuttle service between San Diego airport, your hotel, and UCSD can be requested from Cloud 9 Shuttle. Yellow Cab of San Diego. Please consult their websites to find the current fares and conditions. Complimentary shuttle service from hotel to UCSD/SDSC is also available from certain La Jolla hotels. Taxis and drop-off: San Diego Taxi Information maintains a list of taxis with rates and additional information. Uber and Lyft are also well established in San Diego and now have access to service San Diego's airport. GPSes may need to go to the intersection of Hopkins Drive and Voigt Lane. Bus: An optional method of transportation to UCSD is via the San Diego Metropolitan Transit System (MTS) buses. Students at UCSD often park at University Town Center (UTC) in La Jolla and take the bus onto to campus. Consult the Online Transit Information System Trip Planner for customized route options. Please be advised that the punctuality of the buses cannot be guaranteed due to lateness and delays. 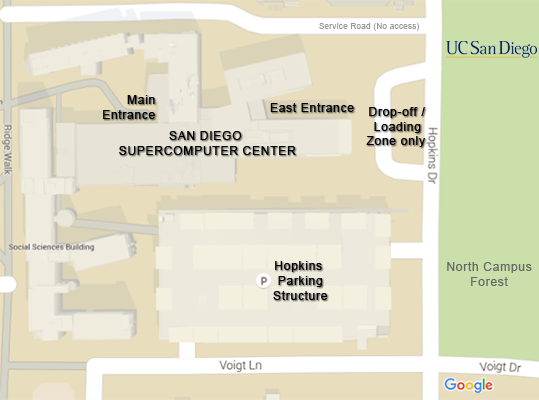 There is a short distance to walk from the UCSD bus stop to SDSC. On Campus: UCSD Transportation and Parking Services has information about on-campus parking and shuttles. A list of local hotels in the area near the San Diego Supercomputer Center is available; a more comprehensive list is on the SDSC Visitor Information page. As a resource for visiting scholars or postdoctoral scholars and students, The following links may be helpful in finding apartments near UCSD.